Steely Dan is an American jazz rock band founded by core members Walter Becker and Donald Fagen. The band's popularity peaked in the late 1970s, and their seven albums over that period of time blended elements of jazz, rock, funk, R&B, and pop. Rolling Stone has called them "the perfect musical antiheroes for the Seventies". Recorded with a revolving cast of session musicians, such as Larry Carlton, Steely Dan's music is characterized by complex jazz-influenced structures and harmonies. Becker and Fagen are whimsical, often sarcastic lyricists, having written "cerebral, wry and eccentric" songs about drugs, love affairs, and crime. The pair are also known for their near-obsessive perfectionism in the recording studio: Over the year they took to record Gaucho (1980), an album of just seven songs, Becker and Fagen hired at least 42 studio musicians and 11 engineers. 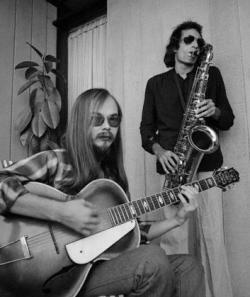 Steely Dan toured from 1972 to 1974 before retiring to the studio. The group disbanded for some years in 1981, and throughout most of the next decade Becker and Fagen were less active, though a cult following remained devoted to the group. In 1993 the two reunited and began playing concerts. Steely Dan has since released two albums of new material, the first of which, Two Against Nature, earned a Grammy Award for Album of the Year. They have sold more than 40 million albums worldwide and were inducted into the Rock and Roll Hall of Fame in March 2001.